POMG's team of guides are as Vermont as maple syrup. They have cycled just about every back road, explored every village, and established friendships with bed and breakfast owners, dairy farmers and innkeepers statewide. 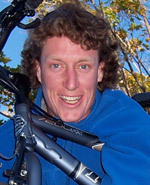 Why do you lead bike tours? 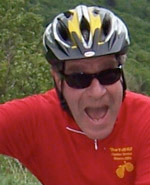 To share my passion of cycling with others in the wondrous Green Mountain State. Favorite Tour? Vermont 100/200 Challenge. POMG means? 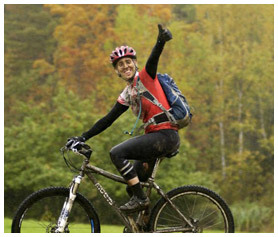 Your bike tour vacation will satisfy your mind, body & soul. Interests/Hobbies? Bicycling, swimming, Nordic skiing, Reading, Singing in my church choir. Other Job? Elementary School Teacher. What does POMG mean to you? A close family of athletic adventurous minded people that enjoy showing guests our beautiful state! Favorite POMG Tour? Echo Lake Weekend. Who inspired you to lead bike tours? Friend and POMG Tour Leader, Mary. Funniest Tour memory? Hmm, probably none that can be published! What is your other job? Fundraising Event Planner at Middlebury College. Other interesting factoids? I'm obsessed with being outdoors. I love to "track" animals, sleuth out what animal left that track and how they move and live in the woods. I'm a terrible badminton player! What year did you start leading bike tours? As Rich's dad, I would never presume to "lead" but have been his side-kick on many tours. What does POMG mean to you? When Rich named his company, he honored his grandpa Bill and embraced his 13 to the dozen philosophy. His grandpa would be proud. 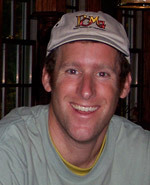 Why do you lead bike tours? I love to ride and as Rich's dad... it is a gift to be asked. What is your favorite POMG Tour? I love them all and each gives a different look at Vermont. What are your interests/hobbies in life? Biking, golf, travel, theater, music, serving on the Board of the Dana Farber Cancer Center in Boston. Who inspired you to lead bike tours/ride a bike? 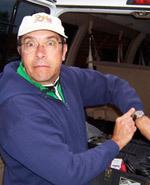 I started serious riding in '87 doing the Pan Mass Challenge 200 mile/two day fundraising bike ride for the Jimmy Fund and have enjoyed European inn-to-inn bike tours with my wife Debbie. 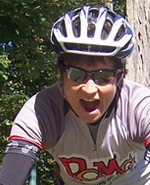 Before Rich started his company, we enjoyed an annual Vermont overnight bike ride and more recently did an Alaskan tour. Other job? Retired so my job is making sure Rich does his! Favorite band? Louis "Satchmo" Armstrong. Interesting factoid? Pretty impressed that Rich's daughter Estelle started biking at 3 without training wheels! What does POMG mean to you? Fun, Fun, Fun! Favorite Tour? 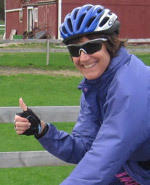 Cycle Vermont & Custom Tours. Interests/Hobbies? Being a Dad, Mountain Biking, Snowboarding, Windsurfing, Geology, Unicycling and Juggling. Who inspired you to lead bike tours? Mr POMG himself, Rich! What is your other job? Carpenter. Other interesting factoids? I led POMG's first camping bike tour with Rich in 1996 and I have two Westies, Arthur and Sweetie. Favorite Tour? 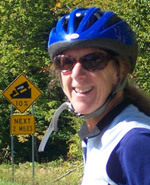 Cycle Vermont . Other job? 2nd year grad student, Marriage & Family Counseling. POMG means? Summer fun, good people, great cycling! Off-Season spent? Skiing and waiting for bike season. Favorite Band? Allman Brothers and Rolling Stones. Why do you lead tours? It’s my favorite job where all of my skills can be put to use. Interests/Hobbies? Mountain biking, yoga, herbalism, local food & beer, reading. Other job? 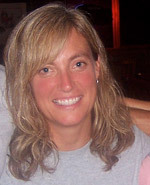 Carpenter, Yoga Instructor, Summer camps for kids. Favorite Band? Michael Franti & Spearhead. What does POMG mean to you? Family PRIDE; Outrageously beautiful bike tours around Vermont; Miles of smiles, going round and round; and Green Mountain living with RICH! What is your funniest POMG Tour memory? Setting up for adult camping tours, now that was funny. Who inspired you to lead bike tours? Rich, of course! Favorite Recent Movie? Soul Surfer. Other Factoid? I am a Buckeye! Interests & Hobbies? Biking, Skiing, traveling, gardening, and pottery. What does POMG mean to you? A Family Tradition, Grandpa Savitt, Peace of Mind Guaranteed! 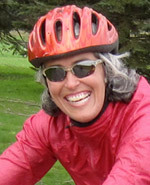 Why do you lead bike tours? To work outside, be active, meet interesting like-minded people, see Vermont and breath clean air! Favorite Tour? Discover Southern Vermont. We ride to and visit architecturally beautiful villages – Chester, Grafton, Woodstock & Weston. Interests/Hobbies? knitting, travel, skiing - nordic & alpine. Who inspired you to lead bike tours? My brother Spence. Other job? Mother to Junebug, 3 years old! Favorite Band? Talking Heads, U2, Bruce Cockburn, Martin Sexton. Favorite recent movie? Toy Story 3. What is your other job? 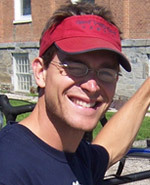 Biologist for Vermont Agency of Transportation, Maple Sugaring, and Carpenter. Favorite Tour? UVM Trek & Cycle Vermont. Who inspired you to ride a bike? Maternal Grandma on her basketed three wheeled beach cruiser! 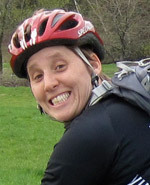 Why do you lead bike tours? I love to connect people to their natural surroundings, Vermont makes it easy! Interests & Hobbies? 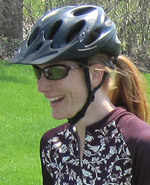 Biking, Gardening, Backcountry skiing/snowboarding & Social Enterprise. What is your other job? 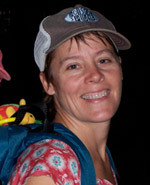 Marketing and Development Director at Girls Move Mountains. Favorite Band? Old Crowe Medicine Show. Other job? Technology Educator at South Burlington High School. POMG means? A family of friends who appreciate cycling...without any stress! Interests/Hobbies? Pinhole & Polaroid photography, abstract art, home-brewing, making pickles and other canned goods. Brushes with fame? Danced with Joan Cusack at a friend's party in Chicago. What does POMG mean to you? Family, and connecting to people. Mr. POMG, my Grandpa, Bill Savitt was and still is the leader of the band. He taught me the Golden Rule, 13 to the dozen service and much, much more. Favorite Tour? All of them, I like to mix it up. Interests & Hobbies? Biking, Alpine & Nordic Skiing, Healthcare, Renewable Energy, Ultimate Frisbee, Hockey, Playing with my family. Who inspired you to lead bike tours? My Father who is now a POMG Leader. What do you do when not leading tours? Chase our mini POMG'ers, Estelle & Savitt; All of the tour development, marketing and admin for POMG Bike Tours, exercise, chaperone middle school snowboarders at Stowe. Other Factoid? Once had dinner with Rose Kennedy on Cape Cod and my sisters call me Fitchie Twerp. "POMG tour leaders can't be beat…The best and most caring folks to be on vacation with. 100% customer satisfaction. We'll definitely be back. We love Vermont and the service provided by POMG is always outstanding." "Support on century day was outstanding. The scenery was spectacular. The leaders truly become your friends over the course of the tour and their attitude helps bring the whole group together as friends as well." POMG tour leader Meghan gives a big thumbs up at the Vermont 50. 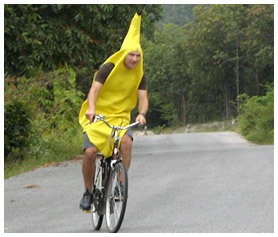 POMG tour leader Neil takes another ride in his banana costume.